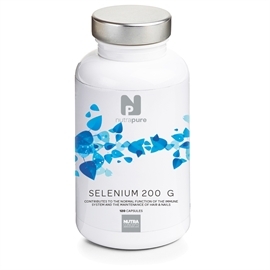 Nutrapure Selenium 200ug is an effective, high strength supplement to help support the body’s own immune system as well as help promote healthy hair & nails. Nutrapure Selenium 200ug is a complex nutrient that provides numerous health benefits due to its high nutrient content. This is why selenium is recommended for various conditions. Selenium is an essential trace mineral found in soil. It has been found to possess numerous health benefits such as boost the immune system, improve hair health, reduce inflammation in the body and even reduce the signs of premature ageing. To help boost the immune system, selenium has been found to stimulate antibodies within the body, to help destroy foreign cells that could cause illness or infection. Hair is made up mostly from protein. Selenium helps to utilize foods containing protein which helps feed hair helping promote hair growth. A dry scalp resulting in dandruff can also be alleviated with selenium as it kills the fungus that creates the dry scalp, causing dandruff. Selenium also has amazing potential for anti-ageing and inflammatory conditions such as Rheumatoid Arthritis (RA). This is because Selenium not only ‘acts’ as an antioxidant but stimulates the creation of ‘more’ antioxidants. This process means that an abundance of antioxidants helps protect cells from free radical cell damage. Free Radicals wreak havoc on healthy cells, damaging them in the process. This can cause inflammatory responses in the body such as heart disease or RA, as well as premature ageing. The protective effect of selenium on cells is important as it helps maintain overall health. Although it’s a necessary element for health, Selenium can be toxic in large quantities. Nutrapure Selenium 200ug provides the correct amount needed daily to help maintain overall wellness and health. It can be found in food sources such as eggs, meat, fish, nuts, mushrooms and Brazil nuts but supplementation ensures you receive the correct dose required for health. Is Nutrapure Selenium 200ug Right For Me? If you have a diet rich in selenium, then supplementation is not necessary. If however your diet isn’t, then a selenium supplement could help alleviate certain conditions being experienced that you never knew a deficiency in selenium would cause. The problem is we are not getting enough. The richest food sources of selenium are Brazil nuts, kidney, liver and fish, but the foods that make the largest contribution to our selenium intake — because we eat proportionately more of them — are cereals, bread, meat and poultry. So, how do you know if your selenium levels are low and what should you do about it? The Nutrapure Difference - What Makes Nutrapure Selenium 200ug better than other Selenium Supplements? Suitable for vegetarians. Approved kosher. Recommended by our health experts Nutrapure Selenium 200ug has been developed by clinical healthcare experts. The ingredients have been carefully formulated with research to ensure they deliver results. Nutrapure Selenium 200ug is also recommended by nutritionists. Selenium contributes to the maintenance of normal hair. Selenium (L-Selenomethionine) (L-Selenomethionine 2% (Se 0.5%), Di-Calcium Phosphate NLT 98%) 200ug, Alfalfa 5mg, Rice Flour 455mg, Capsule Shell: Vegetable Cellulose 100mg. Allergy Advice: Contains No: gluten, lactose, wheat, added preservatives, artificial colouring. Suitable for vegans. Approved kosher. My hair has flourished since taking these. I had a dry, flaky, itchy scalp which soon calmed and healed once I took these. After that, like I said, my hair just flourished. I took this to make my hair, skin and nails look better. After 3 months of taking them my nails are stronger, my skin looks healthier than before and my hair feels stronger also. I am very happy with selenium. My skin looks very good now that I take selenium. My health has improved since I started taking these capsules. I feel better within myself. Selenium has helped keep my skin looking youthful. When I tell people my age no one believes I’m over 60 so I’m very happy indeed.